In Domino Rally zip and zoom your way across dominoes to help the citizens from their everyday troubles! 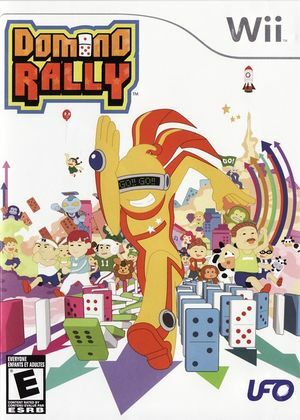 This innovative, quirky and whimsical title delivers a unique game play experience, combining the fun of dominoes with a unique visual style and Wii controls. Block, balance and dash around town to help the citizens with their problems! Battle and race against a friend to earn the acclaimed title of Domino Master! With numerous options & modes, outwit your opponent in a variety of different game settings to see who comes out on top. The graph below charts the compatibility with Domino Rally since Dolphin's 2.0 release, listing revisions only where a compatibility change occurred. This page was last edited on 7 January 2018, at 10:29.